Can the Arts Save Us? Home Reports and Practice Guides Can the Arts Save Us? As strategic initiatives manager for the International Arts + Mind Lab at the Johns Hopkins School of Medicine, I’m constantly learning the amazing ways the arts, music and architecture can improve our lives. 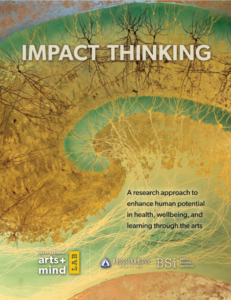 Impact Thinking is the IAM Lab’s consensus framework for research-to-practice efforts in neuroaesthetics. I incorporated feedback from 25 researchers and practitioners into this field-building report.